Situated on the Rawene waterfront, the historic Wharf House dating back to the 1840's (Rawene's first hospital in 1909) has undergone a 10 year long restoration with new bathrooms, heat pumps, kitchen, restored original Kauri floors and more. The Wharf House is a great base to explore the many attractions in the Hokianga and Far North, or as a get away for a quiet weekend. 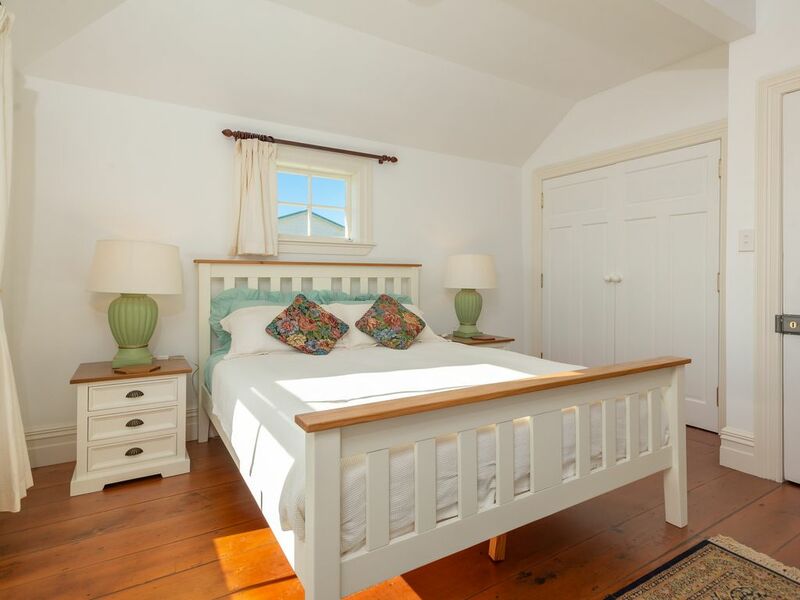 With three spacious and beautifully-appointed bedrooms each with own private ensuite bathrooms, and two living spaces, The Wharf House is a perfect retreat for a relaxing holiday with family and friends. All rooms have queen beds, one room has an added single bed, and one room is fully wheelchair accessible, including the bathroom. Relax on the front verandah and watch the harbour tide and world go by, or enjoy a coffee or BBQ on the back deck and lawn. There are plenty of art galleries and heritage-listed buildings to explore in this historic town. Take a walk on the mangrove boardwalk or visit the monthly Saturday morning market in the town hall. Take a drive to the Waipu forest to visit Tane Mahuta, explore the harbour's sand dunes and Wairere Boulders or watch the sunset from Opononi wharf. The Wharf House is located a 50 minute drive from Keri Keri (Bay of Islands Airport) and 3.5 hours drive from Auckland. Off Street parking is available. The Wharf House is walking distance to the Hokianga Vehicle Ferry, Rawene Foodmart, No.1 Parnell Art Gallery & Cafe, The Boatshed Cafe, Passionate8 gift store, The Puzzle Shop, The Masonic Hotel, Hokianga Takeaways, Clendon House, Rawene Library in the former courthouse and jail, Wardy's fruit shop, Rawene Pharmacy and service station across the road. Fantastic. John looked after us well. Nothing was too much trouble. Lived up to pictures. Amazing views from all rooms. Air con was a blessing as it was quite warm while we were there. So close to everything. Highly recommend. Huge place great for groups. Far from sea but close to river.